Chea Ban, 68, of Lancaster, passed away on Tuesday, March 19, 2019 at Lancaster General Hospital. 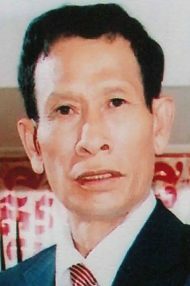 Born in Cambodia, Chea was the son of the late Rin Ban and Chhim San. A loving husband and father of five, passed away surrounded by his loving family. Living in the United States, he was a painter at Horse Group Painting. Chea enjoyed staying active and telling stories to everyone around him. He loved to take his children and grandchildren to the park. Most of all, he cherished spending time with his family. He is survived by his wife, Pathida and his five children: Socheat Ban of Oregon, Vanny Van of Philadelphia, Vanna Ban of Middletown, Chiveak Lorn of Lancaster and Chivorn Lorn of Lancaster; his Grandchildren: Giana Cheng, Malaya Santiago, Joshua Santiago and Hanna Ban and one sister. He is preceded in death by three brothers. Family and friends are invited to a viewing on Saturday, March 30, 2019 from 1PM to 2PM at Charles F. Snyder, Jr. Funeral Home & Crematory 3110 Lititz Pike, Lititz PA followed by a Buddhist Funeral and Cremation Ceremony.